McAfee Knob receives about 90,000 visitors every year, so it is really important to Leave No Trace. The Subaru National Leave No Trace trainers conducted training and awareness programs near McAfee Knob in 2015 and 2017. 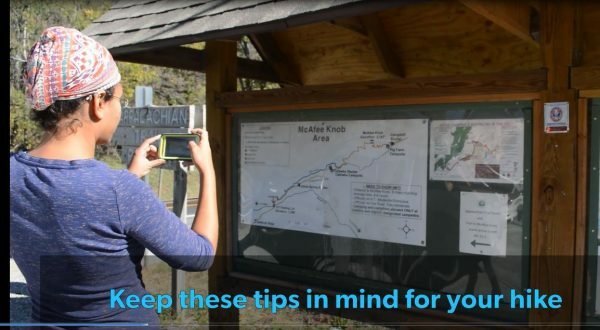 After their most recent visit, the prepared this short video with tips for people who want to enjoy McAfee Knob while treading lightly. For the latest news and alerts on Virginia’s Triple Crown, also check our Facebook page. Want a Triple Crown t-shirt from RATC? It comes in GREEN and RED. All proceeds help RATC maintain and protect over 120 miles of the AT. Available through our online store here. LOOKING FOR MAPS OF THE TRIPLE CROWN? 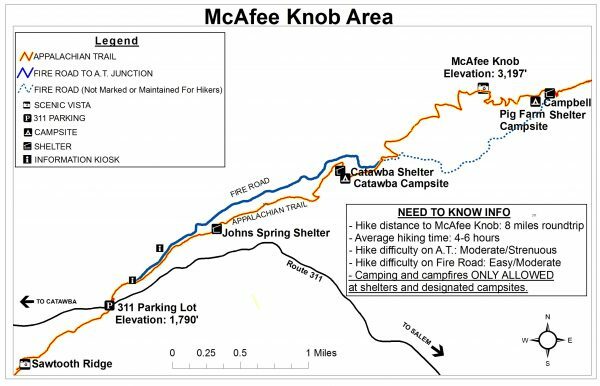 This page has an overview map of the entire Triple Crown and a detailed map of the day hike to McAfee Knob. For a more detailed map, go to an outdoor store or the Appalachian Trail Conservancy’s online store and purchase Central Virginia Maps 3&4. They are waterproof and contain the entire Triple Crown section. Check this link for elevation profile and other details of the section. HERE FROM OUT OF TOWN AND WANT TO DAY HIKE THE TRIPLE CROWN? There is a new option for those who want to stay in nearby Salem, Virginia. Salem Motor Lofts is a newly remodeled AirBnB option in the middle of downtown off I 81 Exit 140. You can rent an entire small apartment and be within walking distance of half a dozen restaurants, a brew pub and a farmer’s market. Distance to Triple Crown trailheads: 9 miles to McAfee Knob, 13 miles to Dragon’s Tooth, 18 miles to Tinker Cliffs/Andy Layne Trail. Click here for directions. Highway motels are also available at I 81 exits 141 and 137. TRIPLE CROWN: LEGAL CAMPING, SPECIAL RULES, HIKING ITINERARIES AND TRAILHEADS. McAfee Knob and the Triple Crown are part of a national park – the Appalachian National Scenic Trail – that is managed collaboratively by the National Park Service, the Appalachian Trail Conservancy and the Roanoke Appalachian Trail Club. Usage of this section of the AT has increased dramatically in the past 6 years. If you plan to take on this challenge, please respect the resource and the beings that inhabit it by practicing Leave No Trace principles, The volunteers of RATC hope you enjoy and treasure the trail! Click here to download a larger version of the overview map shown below. 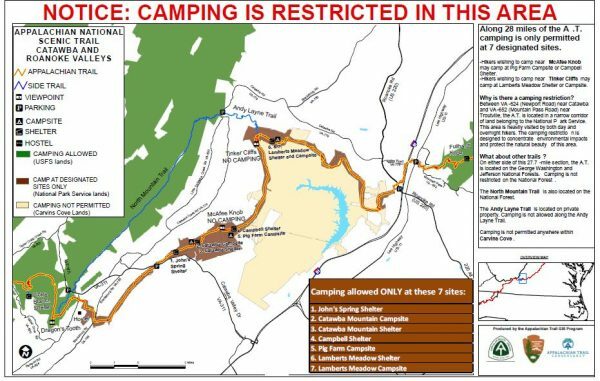 No camping or campfires outside of 7 designated areas (see map above: north of Va 624/Newport Rd, the only legal campsites are Johns Spring Shelter, Catawba Shelter and campsites, Pig Farm campsite, Campbell Shelter and Lambert’s Meadow Shelter and campsites). Please exercise caution – a small fire on this section took 4 days to put out in November 2016. Dogs must be kept on leash at all times – this is National Park Service land with special rules – no electronic collars – Pets must be restrained on a leash that does not exceed six feet in length. Pet excrement shall be disposed of only at sanitary facilities within the park or must be buried six (6) to eight (8) inches deep at least 200 feet from any trails, overnight sites or water sources. PLEASE PRACTICE NO TRACE AND CARRY EVERYTHING OUT! NATIONAL PARK SERVICE AND USE OF DRONES: The NPS prohibits the use of drones on the AT section from Va 624 (just trail-north of Dragon’s Tooth) to Va 652 (trail-north of Troutville). This is includes both the McAfee Knob and Tinker Cliffs sections. The hike from the Va 311 parking lot to McAfee Knob is just under 8 miles roundtrip, with a 1,400 foot gain in altitude, most of it in the final 1.5 miles. Most people take 4 to 6 hours to complete the hike. Be sure wear good walking shoes and take water, a flashlight (cell phones don’t count as flashlights), a snack, a map, a compass and extra clothing. Via the AT and the fire road. From the parking lot (P) begin by carefully crossing Va 311 to the white-blazed Appalachian Trail (brown line). Climb the hill and steps on the AT In about 0.5 mile, you will reach a kiosk (“i” on the map). Go left towards the fire road and then right on the fire road (blue line). Walk about 2 miles on the fire road to its second junction with the AT (end of solid blue line on map) – many people who take the fire road miss this turn! Turn left up the stone steps to take the AT (brown line) to McAfee Knob, about 1.5 miles. At the top of your climb, you will see a sign pointing left towards the View at McAfee Knob. Via the AT. From the parking lot (P) begin by carefully crossing Va 311 to the white-blazed Appalachian Trail (brown line). Climb the hill and steps on the AT In about 0.5 mile, you will reach a kiosk (“i” on the map). Go right to stay on the AT (brown line). The AT will again cross the fire road in about 2.5 miles (intersection of solid blue and brown lines beyond Catawba Shelter and Catawba Campsite). Stay on the AT by climbing the rock steps on the far side of the fire road and climbing about 1.5 miles to McAfee Knob. At the top of your climb, you will see a sign pointing left towards the View at McAfee Knob. Returning via the fire road. Heading back from McAfee Knob towards the 311 parking lot, take the AT (brown line) for about 1.5 miles to its intersection with the fire road (blue line). Turn right on the fire road (blue line) and walk about 2 miles to its junction with a marked spur trail back to the AT. Stay left at the junction and walk up to the kiosk (“i” on the map), which is on the AT (brown line). Turn right on the AT to return to the 311 parking lot in about 0.5 mile. Some folks get a little confused on this section! Alternate walk: Sawtooth Ridge. Prefer a shorter walk? It is only about 0.5 mile to a nice overlook in the opposite direction from McAfee Knob. From the parking lot, walk away from Va 311 on the Appalachian Trail (brown line) to the overlook on the left. You are looking into Mason’s Cove. DALEVILLE PARK AND RIDE LOT AT I-81 EXIT 150. From I-81, take US 220 about 0.5 miles northwest of Exit 150 and turn left into Park and Ride, just before gas station (see map of location). This parking can be used for a section hike that includes Dragon’s Tooth, McAfee Knob and Tinker Cliffs via the Appalachian Trail. Click here for Google Maps directions to the Daleville Park and Ride area parking. ANDY LAYNE TRAIL (Tinker Cliffs). (From the north) From I-81, exit 150B, go north on US 220 for 1.75 miles. Turn left on Catawba Road (Route 779). Go 7.6 miles. The gravel parking lot for trail head is on left. This blue-blazed trail to the AT provides access to Tinker Cliffs. (From the south) From I-81, take Exit 140 west (left turn) on Va 311. At first stop light, turn left to stay on Va 311 for 6.7 miles (passing McAfee Knob parking at top of mountain before descending into Catawba). At bottom of mountain, turn right onto Va 779/698 North. 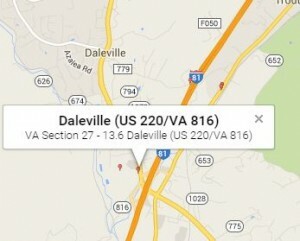 In 75 feet, turn right onto Va 779 (road splits) and go 2.3 miles. Turn left onto Va 600 and go 1.2 miles; continue onto Little Catawba Creek road for 4.2 miles. Slight left onto Va 779 – then turn right into Andy Layne parking lot at right in 0.1 mile. Note that Google maps does not provide a good map to this location. However, you can get directions from Google based on the GPS location of the parking area. VIRGINIA 311 (McAfee Knob – National Park Service lot). (From Roanoke) Take I-81 south to exit 141. Go left on Virginia route 419, Electric Road. Go .4 miles to Virginia route 311. Take a right and go 5.6 miles to A.T. access parking lot on left at top of Catawba Mountain. Please be aware that this parking lot becomes very full on weekends. Exercise caution at all times when crossing Va 311, as the speed limit here is 55 mph. It is not legal to park on Virginia Route 311. If the parking lot is full, go downhill less than 0.25 mile towards I-81 and turn right on Virginia Route 864. Park as far off the road as possible and do not park on sharp turns; this road is used by emergency vehicles. If using Google maps, always use “McAfee Knob parking area” as the search term; other terms may take you to completely different locations. Click here for Google map directions to McAfee Knob parking area. DRAGON’S TOOTH PARKING (US Forest Service lot). (From Roanoke) Take I-81 south to exit 141. Go left on Virginia route 419, Electric Road. Go .4 miles to Virginia route 311. Take right. In 4.6 miles, pass McAfee Knob trailhead parking lot on left at top of Catawba Mountain. To reach Dragon’s Tooth parking lot, continue on route 311 for another 3.5 miles to US Forest Service Dragon’s Tooth parking lot on left, just after the intersection of Va 311 and Va 624/Newport Road (gas station and convenience store on the left). If using Google maps, always using “Dragon’s Tooth parking area” as the search term; other terms may take you to completely different locations. Click here for Google map directions to Dragon’s Tooth parking area. TROUT CREEK PARKING AREA (Va 620). (From Roanoke) Follow directions above to Dragon’s Tooth parking area. Proceed another 4.1 miles on Va 311 and turn left on Va 621. Drive 2.8 miles on Va 621 to Va 620. Turn left on Va 620 and drive 1.1 miles to Trout Creek parking area. Click here for Google Maps directions to the Trout Creek parking area.